The Crowne Plaza Felbridge in East Grinstead, Sussex is now fully open following its £3million plus refurbishment and rebranding with smart new facilities for the business traveller. All 116 bedrooms and suites have been stylishly redesigned along with the conference and meeting facilities, public areas and restaurant transforming the hotel into one of the smartest business centres in the south east. Business guests staying overnight can upgrade to a Club Room, which includes private access to the new, contemporary style Club Lounge located on the ground floor. Open 6.30am-10.30pm, benefits include a complimentary continental buffet breakfast and early evening reception with hors d'oeuvres, alcoholic and soft beverages, newspapers and magazines and use of a tablet or PC. 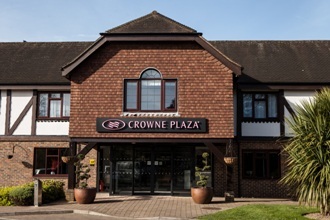 Located under 10 miles from London Gatwick international airport on the edge of East Grinstead, the Crowne Plaza Felbridge is within easy access of both the M25 and M23 motorways, while East Grinstead train station offers a direct service to London Victoria in under an hour. There is also ample free on-site parking for hotel guests and complimentary Wi-Fi throughout. For guests planning to combine their overnight stay with a business meeting, or attending a conference, there are eight air-conditioned conference and board rooms offering flexible and stylish space with natural light. They can accommodate as little as two guests for a discreet lunch or private discussion, up to 500 delegates theatre style for a grand seminar or 300 for a seated dinner. Hotel guests also have use of the Chakra Spa, where the five luxury treatment rooms, gym, indoor pool and steam room are due for a total upgrade later this year. For more details and to make a booking call the Crowne Plaza Felbridge on Tel: 01342 337700; or visit http://www.cpfelbridgehotel.co.uk; follow on Twitter @CPFelbridge and Linked In at http://www.linkedin.com/company-beta/1870377.